Freeform bracelet by Stephen Dweck. 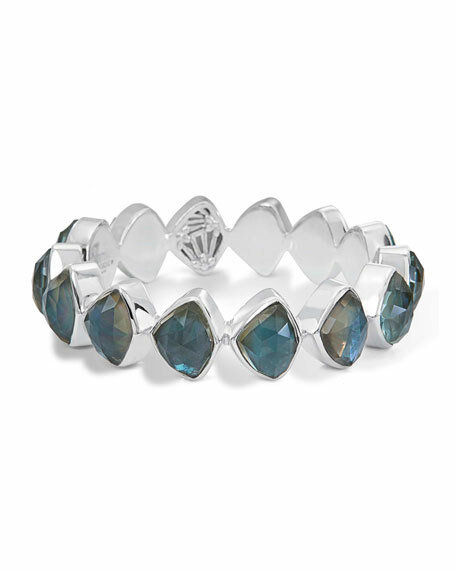 Faceted aqua quartz and mother-of-pearl doublets. Known as "The Romancer of the Stones," Stephen Dweck is strongly influenced by his love of art and nature. This passion even inspired him to collect stones and minerals from around the world for his one-of-a-kind designs. Each is adorned with Adam, his signature beetle, symbolizing his affinity for nature. This devotion is what makes him one of jewelry's most widely recognized names today.